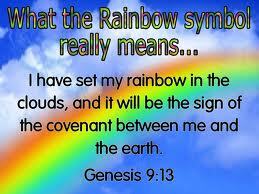 “I do set My bow in the cloud, and it shall be for a token of a covenant between Me and the earth. …and I will remember My covenant” (Gen 9:13,15). God knew that the imagination of man’s heart is evil from his youth. But God was pleased with the sweet-smelling savour of Noah’s offering and He made a covenant with man not to curse the earth any more, and gave him a sign of His covenant, that is, the rainbow. When dark clouds of trials and temptations rise in our lives, we can look to the cross where the Lord has made a covenant of safety with us. If you look at your trial you’ll be discouraged; if you look at the cross you can press on cheerily no matter how threatening the trial. A covenant is always two-sided i.e., two parties are equally responsible in adhering to the conditions. God remembers His covenant when the clouds arise in the horizon. We are also expected to remember our covenants with God when clouds arise, i.e. when troubles arise in our lives. Many remember their covenant with the Lord only when everything is going on well in their lives. When unexpected baffling difficulties confront them, they lose the vision of the cross they forget their covenant with God; they forget God’s covenant with them. When John the Baptist was eating the sweet wild honey and the de1icious locusts he was very boldly declaring, “Behold, the Lamb of God which taketh away the sin of the world.” But when he was imprisoned and fed with the bread of sorrows and water of afflictions, he doubted the very lordship of Jesus. If Jesus was the Messiah or the King of the Jews, why did he, John, have to suffer in prison, he being the forerunner of Christ? There are many John the Baptists even today. When everything is alright we can see them in the meetings, boldly testifying about Christ. But when they are imprisoned with weaknesses and privations, they doubt the all-sufficient, all-surpassing grace flowing from Calvary. Child of God, what are you looking at – the dark clouds or the rainbow?